WB Police Constable Admit Card 2019: The candidates who have completed the West Bengal Police Constable Exam Online Application form which has been released by the West Bengal Police Recruitment Board in the Month of February 2019. Now, the board is going to conduct its written examination in the upcoming months. 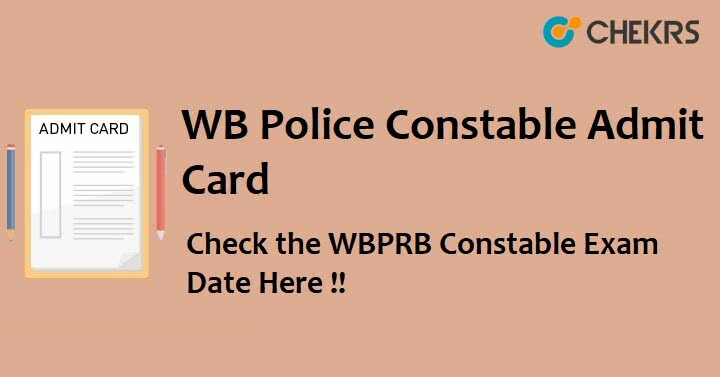 The WBP Constable Admit Card 2019 has been uploaded on the official web page. You can take the help of the simple guidelines specified below to download the WB Police Constable Admit Card 2019. You are compelled to carry the admit card in order to attend the exam. The e-Admit Cards will be available on the WBPRB Website on keying of Application Sl. No. & date of birth. Follow the given instructions to download your WB Constable Exam Hall Ticket. Go to the ‘Recruitment’ tab available on the home page. Now, click on the link of recruitment to the posts of a police constable in West Bengal available there. Move further and select the link for WBPRB Constable Prelims Admit Card 2019. Proceed forward and collect your exam call letter. The tentative date for the preliminary written examination has been declared by the West Bengal Police Recruitment Board. Check out the official notice inserted below regarding the WBPRB Constable Exam Date. We will keep you updated about any change in the exam schedule. Applicants can now collect their e-admit card of the written exam from the board’s website. The candidates shall have to produce the printout of their e-Admit Cards at the allotted venues for appearing in the said test. The candidates are advised to follow the instructions on their West Bengal Police Constable Admit Card and visit the website frequently to get regular updates. Keep your exam hall ticket safe throughout the whole recruitment process. Take the help of Previous Papers to boost up your confidence and strengthen your preparation. Remarks: Thanks to reading our article and we hope that it contained sufficient information regarding the WB Police Constable Admit Card 2019. Leave your related queries in the comment box.